Thenthuk and Thukpa are two hearty soups that we find in all Tibetan settlements across north eastern India and Northern Himalayan states. 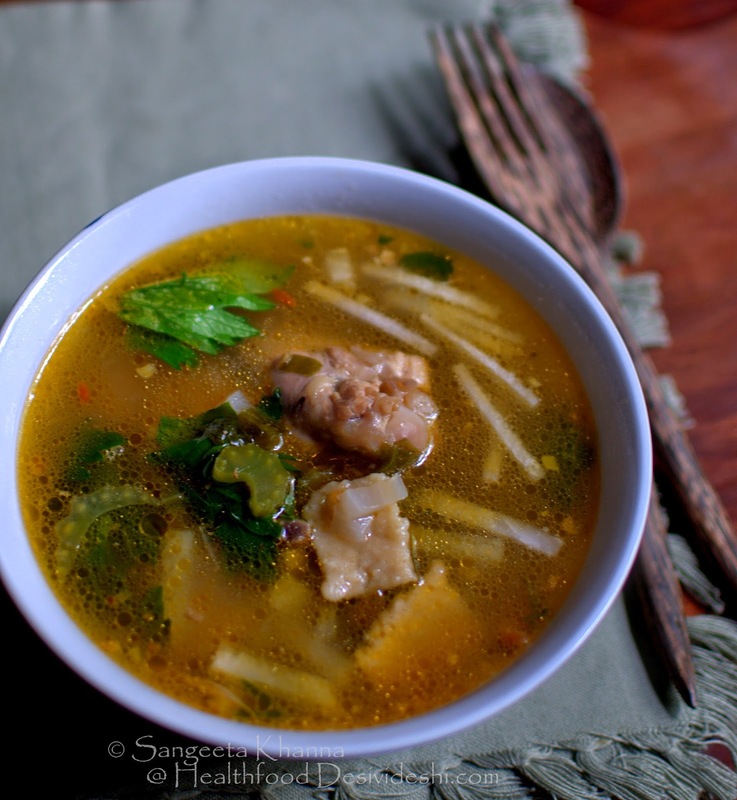 While thukpa is a flat noodle, thenthuk is a pulled noodle or bite sized pieces of a flat noodle. This is such a practical shape of noodle that one can keep having a bite of noodle in every spoonful of soup and feel comforted all the while. Thukpa and thenthuk both soups are cooked with a hearty meat stock, some refreshing hill vegetables and some freshly made noodles. Here we are making the thenthuk noodles with oats. This is a practical way to make soup meals healthier and tastier. 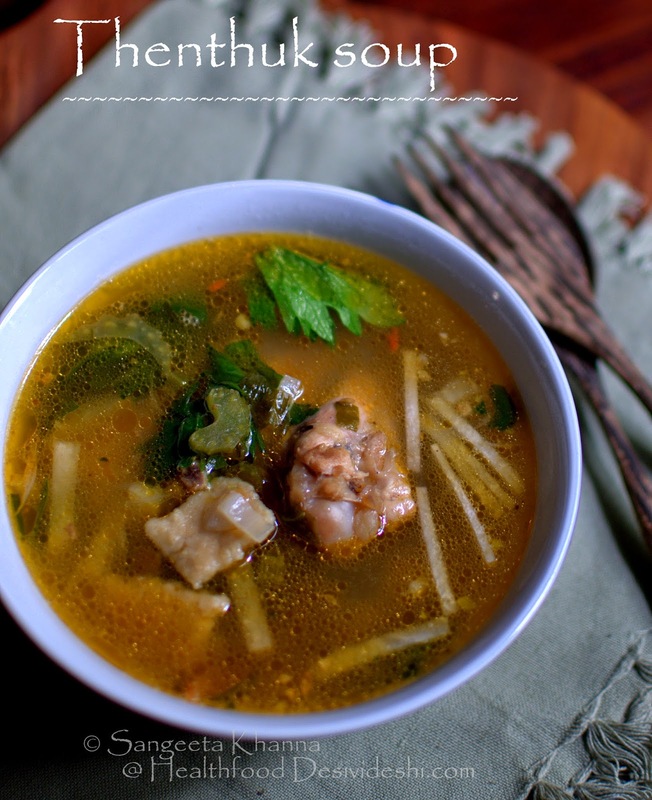 This thenthuk is a hearty soup meal and one can have large amounts of it without worrying about overeating. Why I felt like a soup in this hot summer? Thenthuk is quintessentially a winter soup for me but I got a mild throat infection right now and needed a nice chicken soup. I also wanted to make it a meal and asked the husband if he is a sport. He was happily nodding for a chicken soup for dinner. Although it is only me who wants light cooling type meals for summers, he loves his mutton curry and roti even when the temperatures are soaring. I made a few nice light mutton curries this season, will post them soon. But Thenthuk is different. It is light and cooling for the system and you can choose to have it piping hot or just warm for your comfort. Fresh celery feels cooling in summer and brings back the flavours from the hills too. 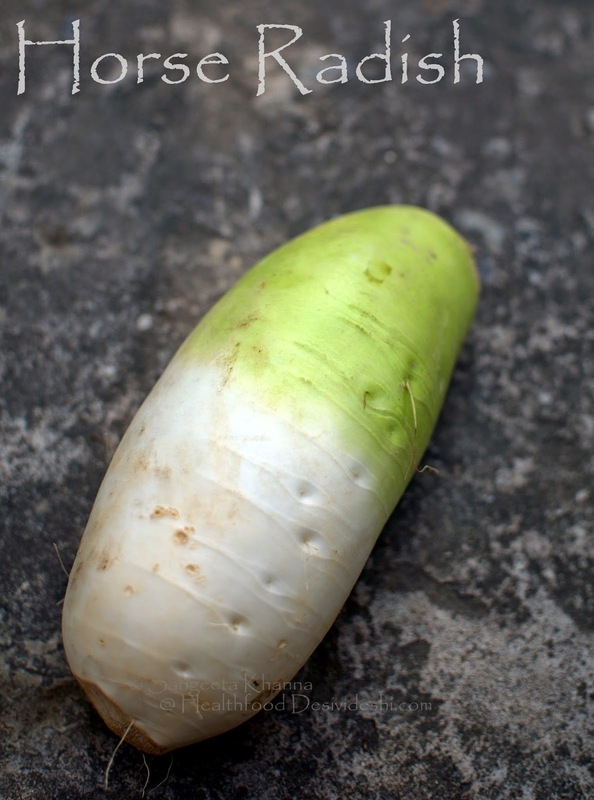 I had brought a plump horse radish from INA market and that came handy in making the thenthuk with the authentic Tibetan flavour. Mix the whole wheat flour and oats and knead a stiff dough by adding water. Keep aside. You can use only whole wheat flour for convenience or even all purpose flour if you wish. Heat oil in a deep pan, tip in the minced garlic, spring onions and celery in that order. Sauté till everything gets translucent and aromatic. Add the tomatoes, salt and 700 ml of water and let the soup simmer for about 40 minutes. The chicken wings help make a nice stock as the soup cooks in the same broth. Fish out the chicken wings at the end. 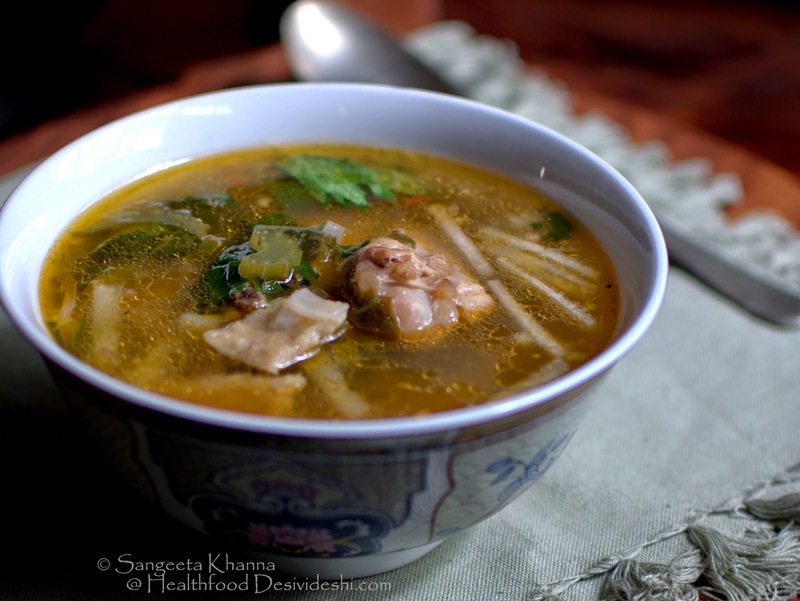 Add the boneless chicken pieces and horseradish batons to the simmering soup and let them cook while you add the pok choy and thenthuk one by one. To make the thenthuk, roll the dough in a thin cylinder and flatten it like a ribbon in the hands. Now break bite sized pieces form this ribbon and chuck them into the simmering soup. They will be cooked in about 15 minutes. Add the soy sauce and schezuan pepper powder. You can add a star anise too if you wish. The soup will be really aromatic by this time. Add the celery leaves and serve the soup right away. 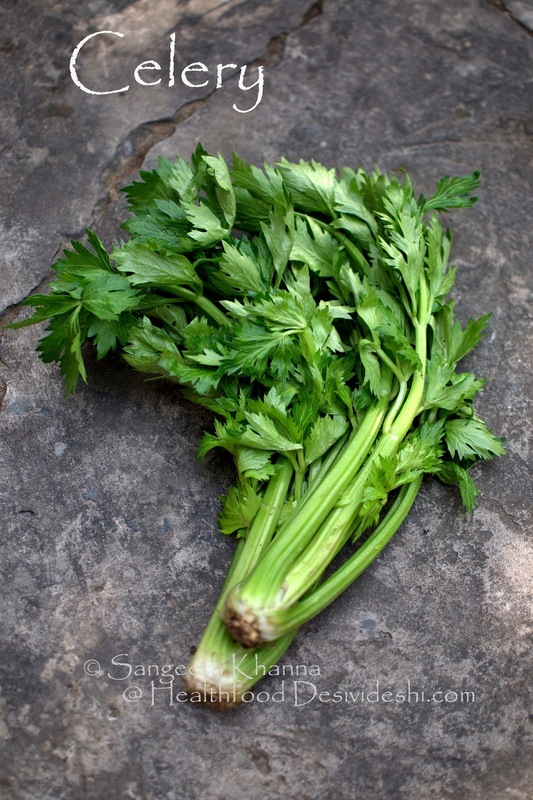 You can replace celery with aromatic culantro (a mountain herb) or coriander greens and stems. But celery lends the authentic flavour to the soup. I have posted the Thukpa, Momos, Fingsya and Tingmo bread in the past and this Thenthuk recipe adds to the Tibetan repertoire on this blog. Hope you enjoy the recipes from Tibet that are so popular all over India now thanks to everyone travelling to the hills where these foods are made in the purest form. Looks delicious.. I have bookmarked it. Will definitely make it soon. I would love to have this soup anytime! Looks soul satifying :-).